Opera Mini probably needs no introduction - it has been around since the flip phone era, and continues to be developed for both basic phones and smartphones. 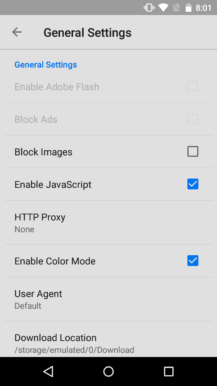 Unlike the other browsers on this list, Opera Mini renders pages on an off-site server, and sends the result back to your device for viewing. 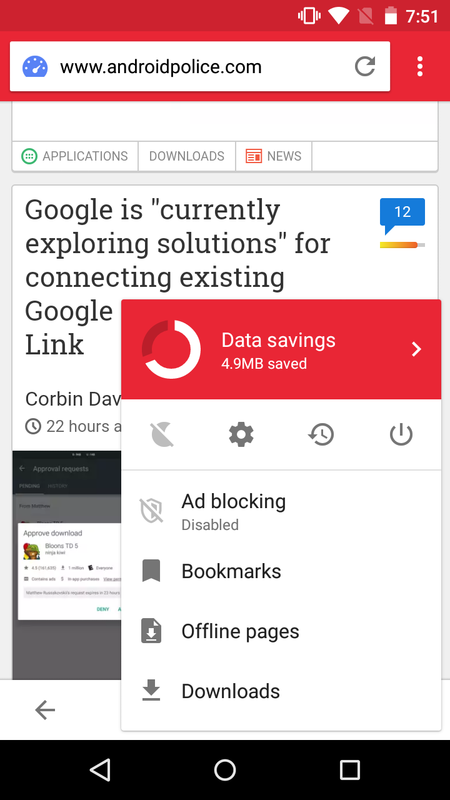 The data is compressed along the way, so if you have limited cellular data (or terrible speeds), Opera Mini might be the best choice for you. The browser has a few different levels of compression, with the extreme option breaking page layouts in some cases. 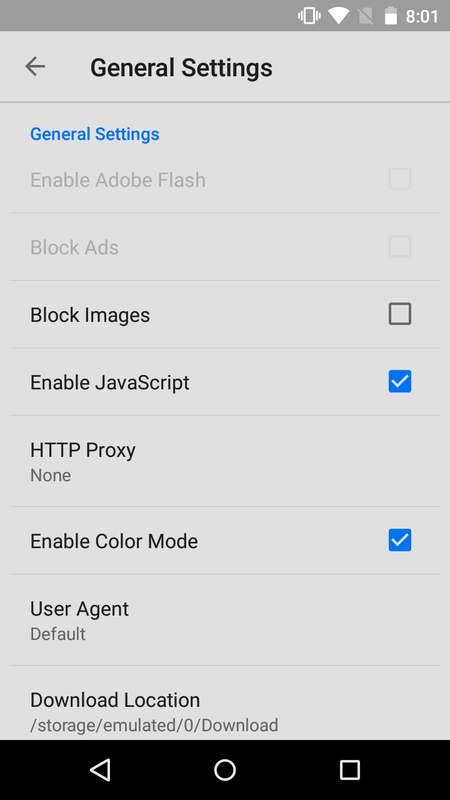 Ad blocking and limited video compression options are also available. Even if data usage isn't a concern, it has a few other neat features. You can change the primary UI color, and both phone and tablet layouts are available. 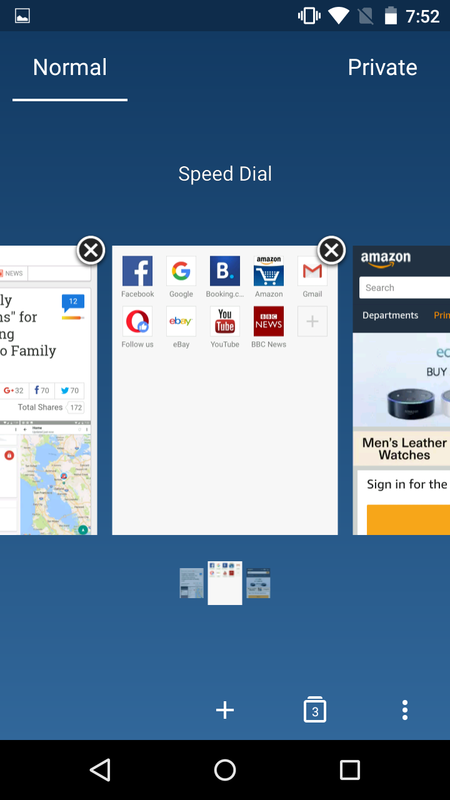 Finally, if you use Opera on the desktop, you can sync your bookmarks/tabs/speed dial by connecting your Opera account. 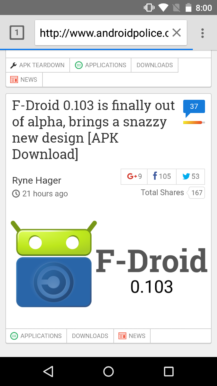 That being said, I do have a few minor annoyances with Opera Mini. 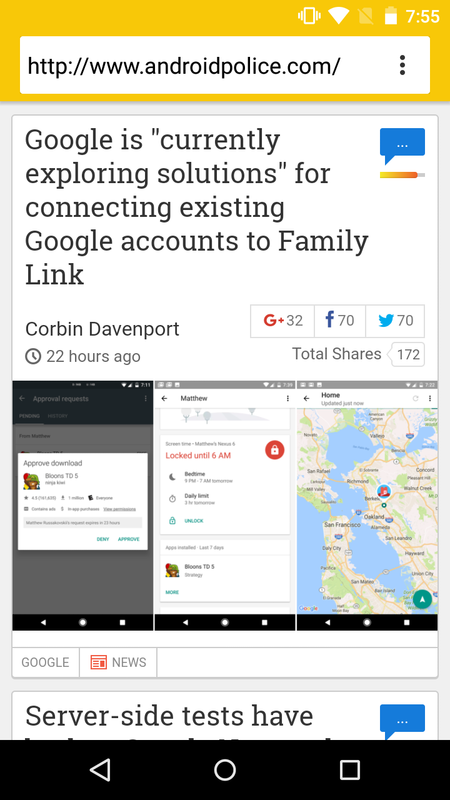 By default, it shows recommended news stories on the Speed Dial and in your notifications. Thankfully, both of these features can be turned off in the settings. 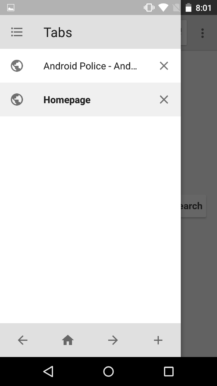 There also doesn't seem to be any way to change the user agent to a desktop browser, so tablet users are stuck with mobile sites (unless the site you're reading has a switch). 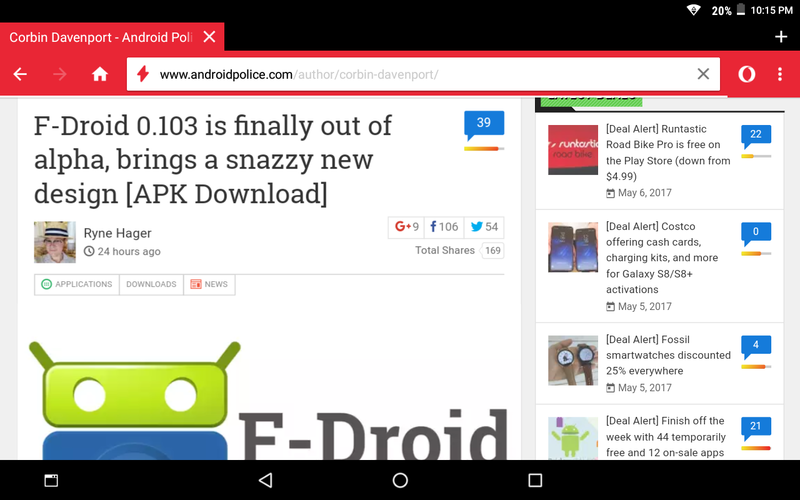 You can download Opera Mini from the Play Store below, and it will work on Android 4.1 or higher. This is a lesser-known browser, but easily one of the best I've tried. 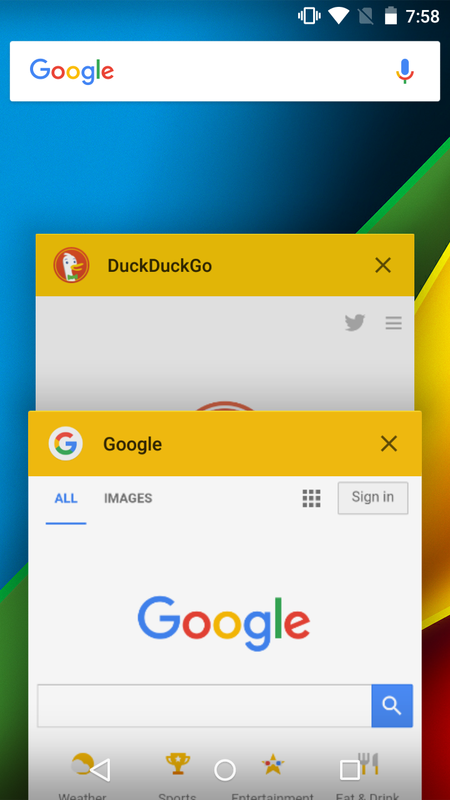 It looks and feels very much like Chrome, but has more customization options. 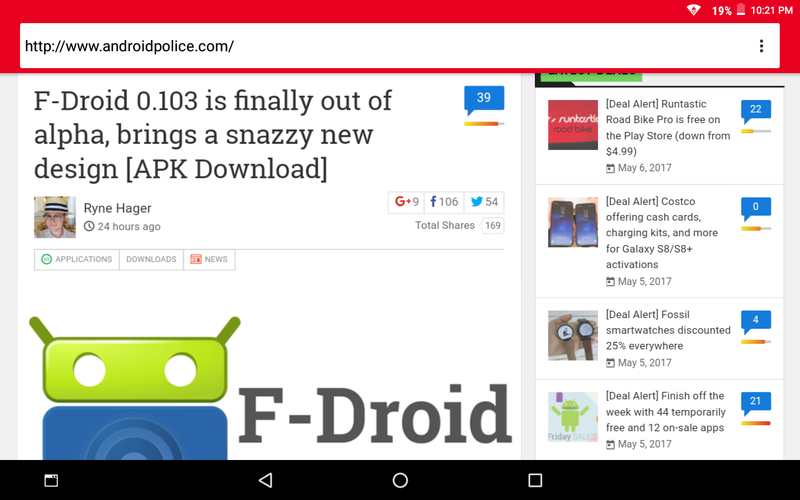 Just like Opera Mini, there are both phone and tablet layouts. There are also light and dark themes, plus a blacked-out design for AMOLED devices. 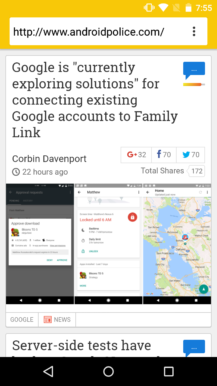 The best thing about Lightning, in my opinion, is that it uses Android's built-in WebView engine. 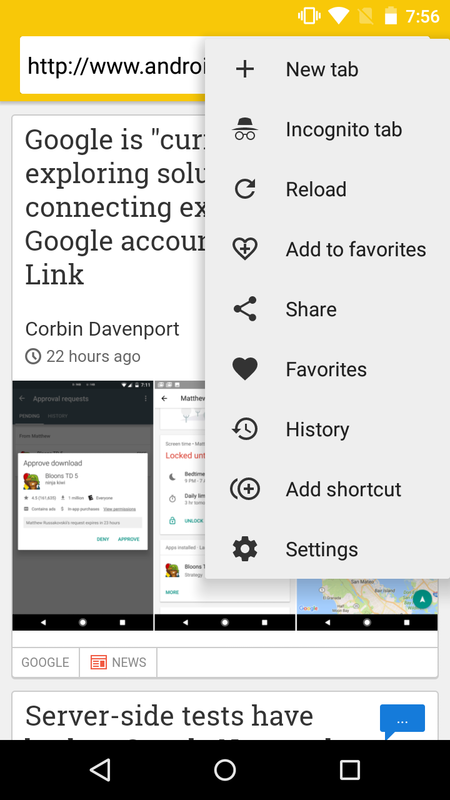 On Android 5.0 Lollipop or higher, WebView is automatically updated through the Play Store and is based on Chromium. There are a few differences between the WebView and Chrome engines, but you probably won't be able to tell. In summary, Lightning Browser can probably be best described as 'Chrome Lite.' To make things even better, it's fully open-source! 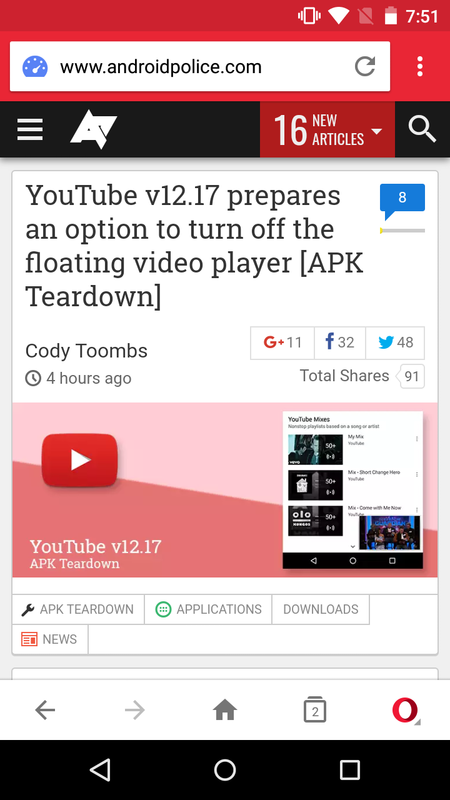 You can get it from the Play Store below, and it works on Android 4.0 and above. Keep in mind that the free version is limited to 10 tabs at once, and the $1.50 paid version allows unlimited tabs and ad blocking. 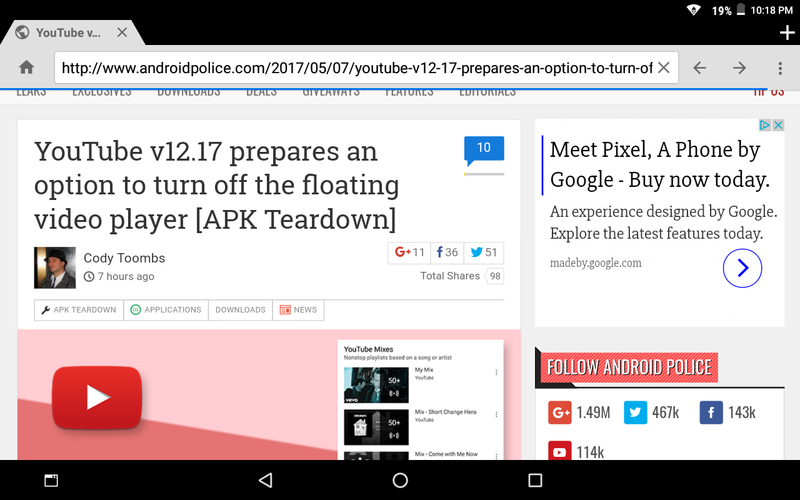 Jelly is a brand-new browser being developed by the LineageOS project as a replacement for the outdated AOSP browser. It is specifically designed for low-end devices, and like Lighting, it uses Android's built-in WebView engine and is fully open-source. The browser itself is a bit sparse on features, since it's so new, but it has all the essentials. 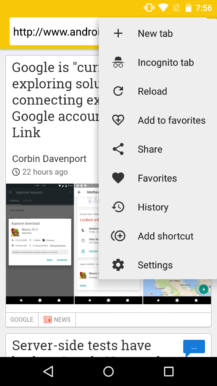 My favorite feature of Jelly is that tabs show up on the Android Recents (multitasking) screen, much like Chrome for Android used to. I still don't understand why it was removed in Chrome, but I'm glad to see Jelly has it. Jelly doesn't have a tablet interface - at least not yet. Unfortunately, Jelly has two major downsides. Right now, it's not on the Play Store, but comes only as part of LineageOS on select devices. The other potential problem is compatibility - it only works on Android 6.0 or higher, so you may not be able to run it on your older devices. I tried lowering the minimum version to Android 5.1 before I compiled it, so I could try it out on my Moto G, but attempting to open the settings page would crash the app. I hope the Lineage project will upload Jelly to the Play Store or F-Droid in the near future, but for now, you can grab it from APKMirror. 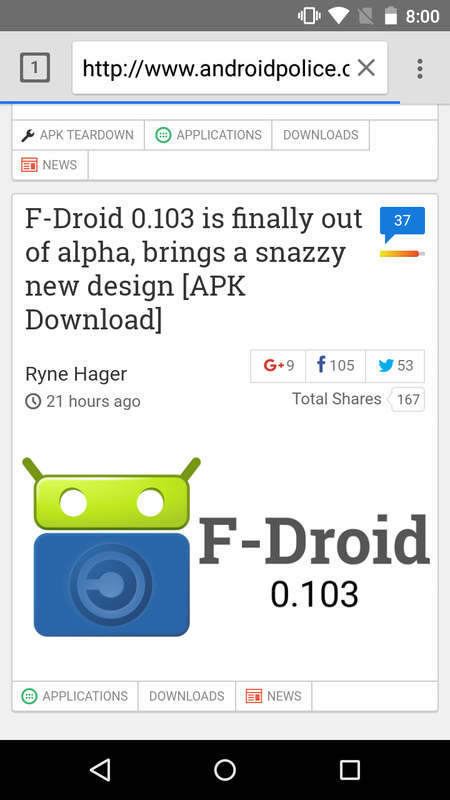 You'll need Android 6.0 or higher to use it. Now it's time to see how well each browser works. For my testing, I used Opera Mini 24.0.2254 (with all data savings options turned off), Lightning Browser 4.4.2, and a Jelly build compiled from source on May 6, 2017. Lightning and Jelly were both using Chromium WebView 58. All testing was performed on a Lenovo TB3-850F, which is the slowest Android device I own that can run all three browsers. I was going to use my ancient Samsung Galaxy Player 5.0, but I was unable to get a stable Android 6.0 ROM running. Performance was pretty close across all three browsers, with Lightning and Jelly nearly identical in performance and Opera Mini following closely behind. Considering both Lightning and Jelly use the same WebView engine, this shouldn't be much of a surprise. Again, there's not much variation between all three browsers. None of them are missing out on any major features. There really isn't one browser that trumps the rest - each one on this list has its own strengths. 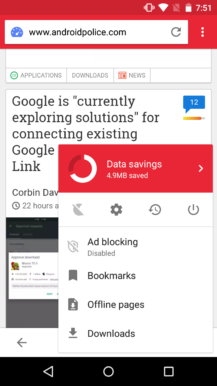 If saving cellular data is a priority, or if you already use Opera on other devices, Opera Mini is definitely the way to go. If you just need something fast, Lightning and Jelly are both great options. Many low-end devices, especially older ones, are stuck on older versions of Android with no hope of updates (custom ROMs aside). 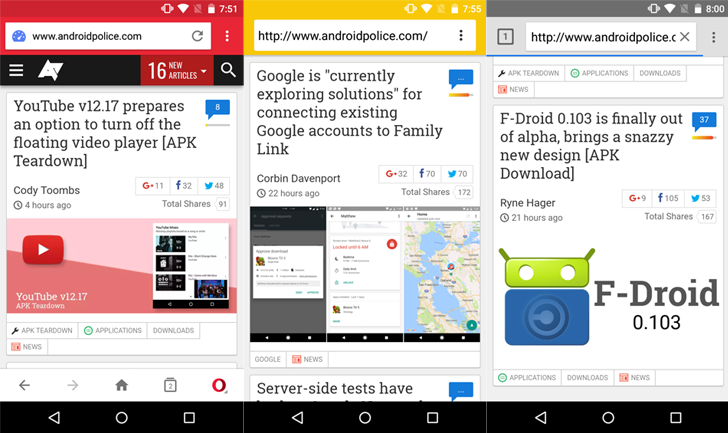 Both Opera Mini and Lightning Browser have great compatibility, but Jelly requires Android 6.0 or higher. This is because Lineage isn't actively maintaining any ROMs running below that, so there's no need for the project to expand the browser's backwards compatibility. Personally, I've used Opera Mini for years on various devices, but Jelly might be my new favorite. Let us know in the comments below what your Android browser of choice is, and what kind of phone/tablet you have.